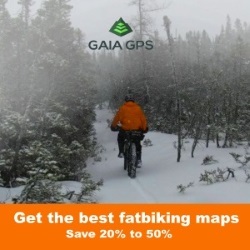 Snowshoe 2XL | It just may fit ! 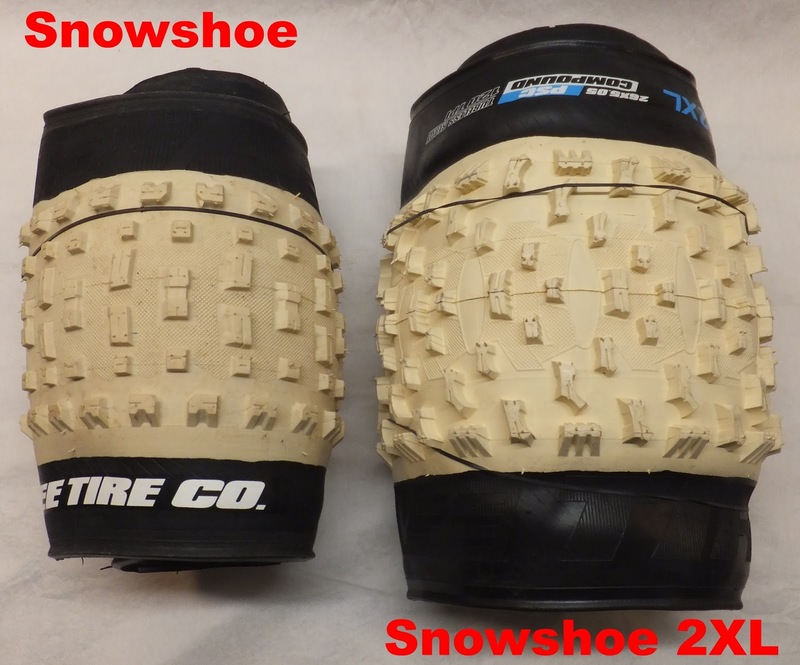 In 2015 Vee Tire announced it was bringing a new supersized tire to the market - the Snowshoe 2XL. Fatbike Republic got a sneak peek and shared some of the preliminary details. As this tire measured in at 5.05" the big question in the fatbike world was "what is it gonna fit?" 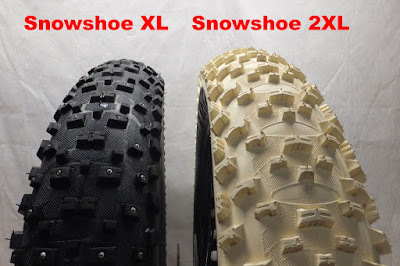 Snow Shoe 2XL the first bicycle tire with a width over 5 inches-available in 26×5.05. 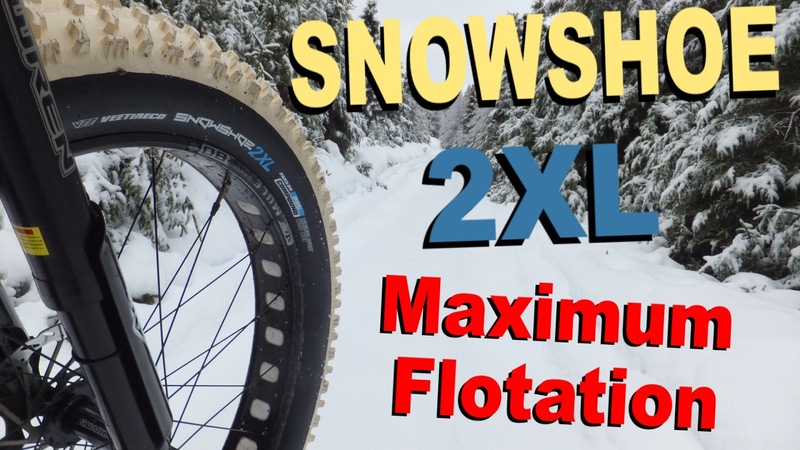 Inspired by the floating sensation of an actual snowshoe, the Snowshoe 2XL is currently the largest FatBike tire in the market. The exaggerated tread features aggressive knobs and deep patterns for increased traction and cornering, no matter what the tire pressure. Since its introduction the shear girth of this float monster has challenged many a fatbike frame (and fork) to handle this beast. 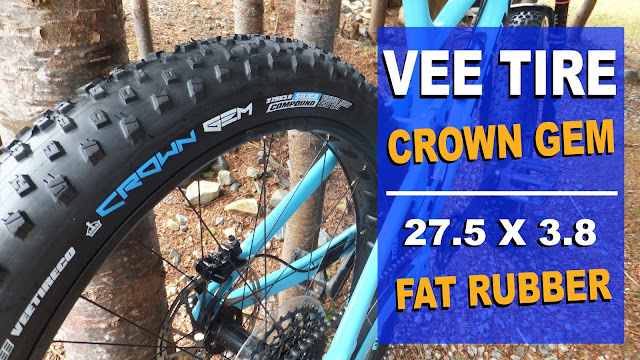 Fatbike Republic wanted to take an up close and personal look at this massive piece of rubber and Vee Tire were gracious enough to send one along. 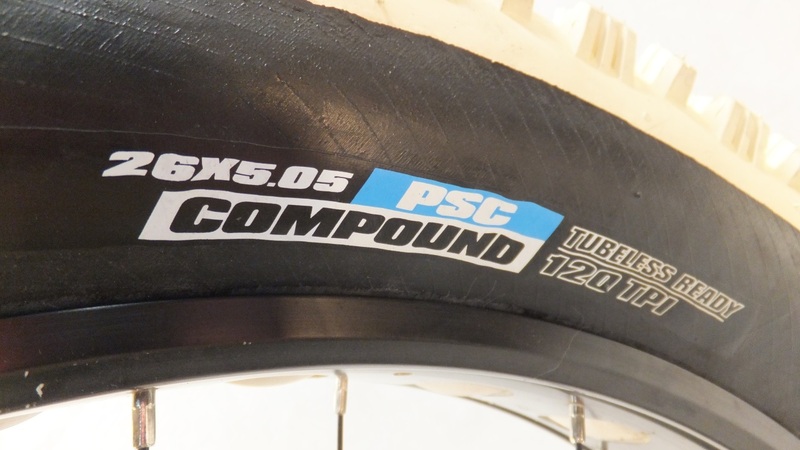 In its current version the 2XL is offered in the Pure Silica Compound (PSC) that has an exclusive off-white colouring. This super soft silica compound allows the tire to perform better on ice, makes it quieter and allows less debris to stick to the tire. For those tire geeks out there, the compound maintains a low hardness of 50A. The PSC compound is also shared with the Snowshoe, Snowshoe XL, Bulldozer and the all new Snow Avalanche. 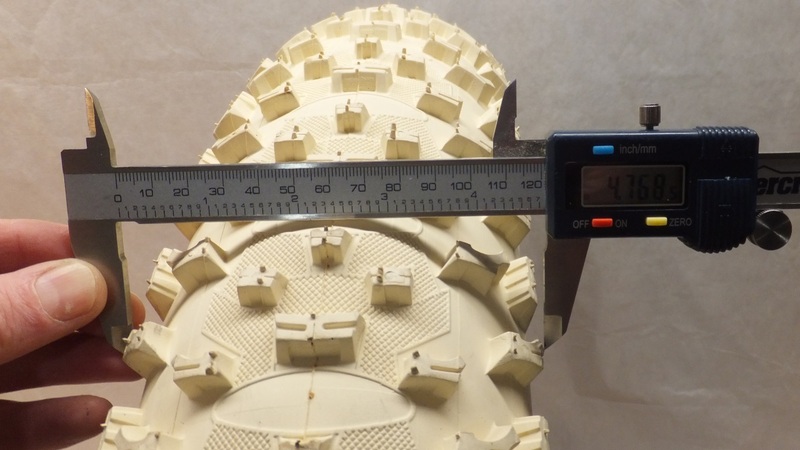 The 2XL is tubeless ready with a 120 TPI, has a claimed width of 5.05” and weighs in at 1920g. The 2XL sports an aggressive tread pattern on its super wide carcass. 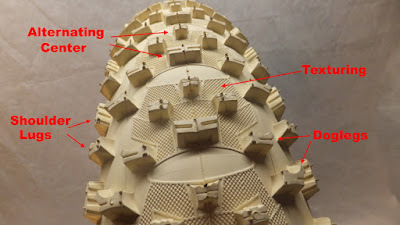 Running down the center of the tire there are alternating wide and narrow slightly curved lugs. Sitting slightly to the side and filling the space between the center lugs are mid sized rectangular knobs. The next two rows of transitional lugs are really interesting as they alternate between mid and large sized doglegged knobs that look super hungry for snow. And finally the heavy shoulder lugs swap between a horizontal modified dogleg and vertical rectangular lugs. 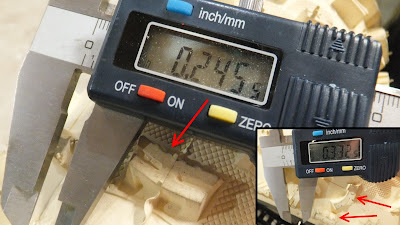 Lug depth runs from 0.25" for the center row to 0.33" for the shoulder lug and large dogleg. This is one meaty tire . . . with the carcass texturing adding that one last element of traction enhancement. Vee Tire claims that the tires are 5.05" wide, however when measured with 8psi on 80mm rims they are closer to 4.77" lug to lug. Not exactly 5.05” . . . but still massive. The claimed weight of these tires is 1970g per tire with the actual weight being pretty close at 1981g. Its no lightweight . . . but it’s a lot of tire. The biggest issue with the 2XL is actually getting it to fit. 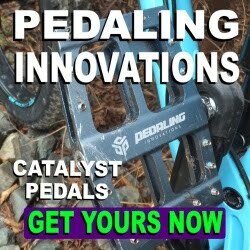 If you have a rigid 150mm front fork there should be no issues. 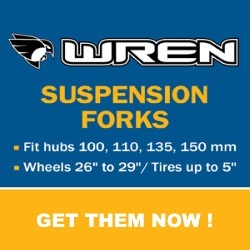 If you want suspension, it will fit a Wren Inverted Fork, but good luck getting it to fit a Bluto. Fitting it in the rear of a fattie you have to be concerned about the frame and chainline. I spent about 2 hours mounting and remounting the tire on a 80mm Mulefut trying to make it fit a 2017 Sasquatch (197mm rear + 440mm chainstay). I was getting very slight chainstay rubbing on three lugs and unfortunately it did not work out. 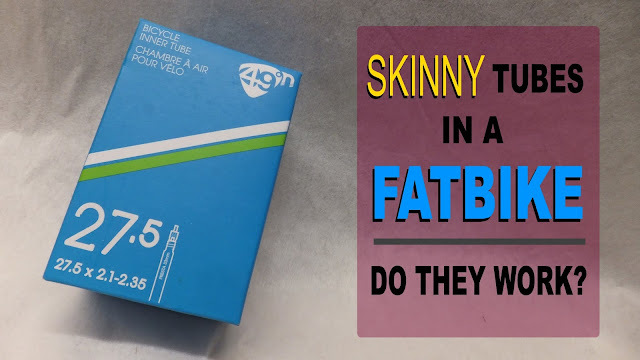 If the chainstays had been ¼” wider the 2XL would have fit. There was no issue with the chainline even in the lowest gear. And even if there was, a chainline can be adjusted slightly. Not being able to mount the 2XL to the rear of the Sasquatch was unfortunate . . . however it did spend time rolling in the Wren on the white stuff. This beast is a float machine and I was amazed with the amount of snow this would plow through/over. At times it felt like the 2XL was creating a trail for the Snowshoe mounted up to the rear. 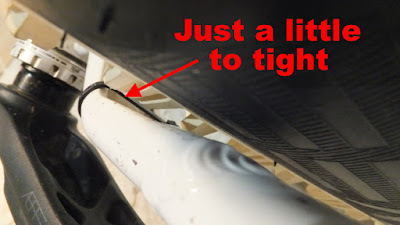 There may not be the need to air down as often when rolling the 2XLs. 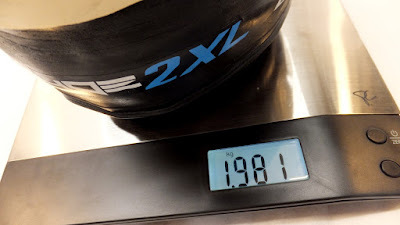 I found that when riding in conditions where I would normally air down a 4" or 5" tire to 3-4 psi to get extra float, the 2XL was cruising along at 6 psi. And with more air there is a lesser chance of a pinch flat. This tire likes ruts . . . in a good way. You know when you are chasing behind someone, trying to stay in the track for best traction, and your tire catches the edge and tries to climb out? Well the 2XL sits in that track and follows like it's on rails. No wandering and no climbing. Although the softer white PSC compound has advantages on ice over regular black compound tires, I steered away from any significant ice riding. 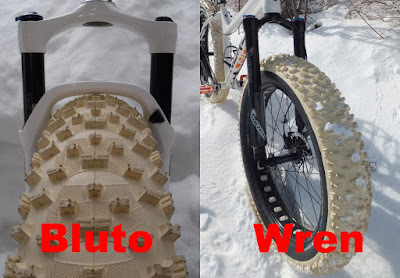 And like all PSC compound tires there was less snow build-up . . . therefore allowing the tire to maintain traction and steering ability. It was difficult to notice if it was quieter as all tires in snow sound "crunchy". If you are running a 1x drivetrain with a 197mm rear I would recommend that you do a test fit. 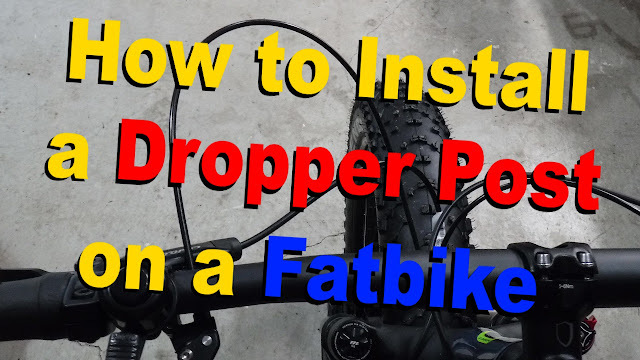 Don't listen to everyone telling you it can't be done until you attempt it yourself as all fatbikes have different geometries. Your bike may have that little extra clearance to make the 2XL work. However if you have a Bluto up front . . . you are gonna need another fork as it rubs the arch/brace. Unless you are heading into some unusually soft terrain in the off season it would be safe to say that with the extra width, weight and lug depth of this tire . . . reaching maximum velocity in the dirt will take some time and effort. So if you are interested in getting the maximum snow flotation in a fatbike the Snowshoe 2XL is definitely the tire for you . . . and it just may fit.